At the commission's last meeting, this property was nominated for landmark status, and was approved. It is one of the churches that is scheduled to close. Since then, the Diocese of Cleveland has stated that they object to the nomination. Time was provided for the public to speak either in support of or opposition to the nomination, however, no one had come to the meeting to speak either way on the matter. The CLC voted unanimously in favor of the nomination. Cleveland Public Theatre (CPT) is building a parking lot on the south side of Detroit Avenue at about West 64th Street, between their current structures and a church that they will be turning into performance space. The parking lot will be 36 spaces and will be "green", as it will include at least a partially permeable surface. The CPT representative stated that code requires an ornamental fence. As the site is in a landmark district, they have to get approval from the CLC. Stephen Manka, of Manka Design Studio, created the proposed design. He stated that the fence was to be 4'6" high, and would be constructed from stainless steel with a brushed finish. The parts would be bolted together. Phase two of the proposed design will include two nine foot high towers and a pedestrian gate at the end of the fence closest to the church. Mr. Manka described the towers, which would be used to display theatre memorabilia, as "reliquaries", which would also pay tribute to the previous use of the structure. 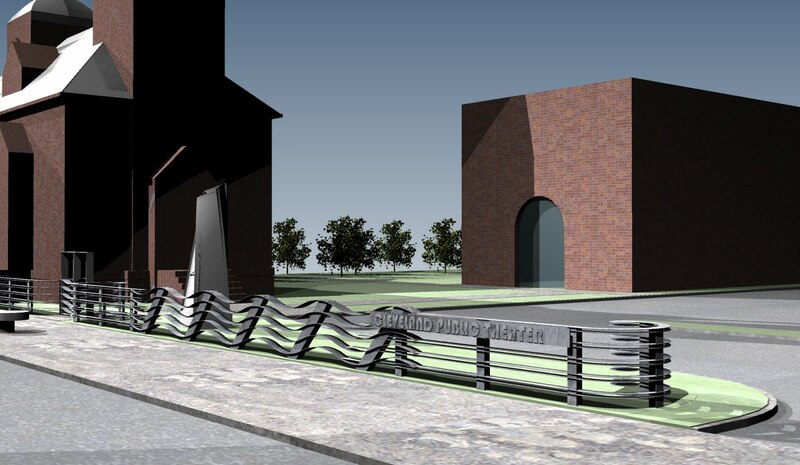 Commission member William Mason called the design a "refreshing approach", noting the three dimensional nature of the design. I agree - so often, fences erected in historic districts are designed to look something like wrought iron - it's nice to see something new with its own, contemporary, aesthetic merits. While I wouldn't rip out a historic wrought iron fence to install this, I think that it fits the situation and the need quite well. The CLC voted unanimously in favor of the first phase of the design. The owner of the house had previously applied to the CLC to demolish the building, in the Ohio City historic district, so that he might erect a new three unit structure on the site. It was addressed in their meetings on August 9, 2007 and October 23, 2008. In addition to the exterior photographs of the structure, the 2007 agenda includes a rendering by Tim Barrett as to how the structure might appear when restored. At the time, the CLC had done a site visit. Inside, while one half of the structure was in poor condition, the other half was found to be quite good and nicely habitable as-is. They denied the demolition request. The request was removed from the agenda for yesterday's meeting because the owner of the structure hadn't presented a new plan, but had instead just resubmitted the one that the CLC had previously voted against. This item involved the replacement of two pairs of doors on the south entrance to the main building of St. Ingatius High School. The existing doors are metal replacements, which were installed in 1971. They have become deteriorated and need to be replaced. They want to replace each of the two pairs with a single door, which will be easier for the students to get in and out of. New doors of the same dimensions would require a variance, as the Ohio Building Code now requires a mimimum clear width of 32 inches. Two designs were proposed, one in wood and one in aluminum. The school's biggest concern with the wood doors was the cost - it was expected to be about $9,000 just to make the doors, before finishing them, hardware, closers, and installation. Further, they are concerned about durability and long-term maintenance costs. It's worth noting that most of the rest of the major exterior doors near the location of this pair are aluminum replacements. The school has been unable to locate any documentation of the original doors. As a result, they're not trying to make exact reproductions. The design of the wood doors appears, to my eyes, historically sympathetic. The CLC's biggest problem, it seemed, with the aluminum doors was the lack of a clear illustration of what was to be installed. Several designs of the general type of door in question were shared, but none of the exact design. The commission voted 4-3 to approve the wood doors only. The understand was made that it would be possible to get back on the agenda at one of the two next meetings, once the exact cost of the doors had been determined and they had exact designs for the metal doors. The city is seeking to demolish this stick style structure to abate the nuisance that it causes to public safety. It was condemned in 2007. At the the owner applied to demolish the building. The demolition request was denied because he failed to show up at the requisite Landmarks Commission meeting. There do not appear to have been any physical changes to the structure since that time. The biggest issue with the structure, according to the city, is physical stability. While it is flush with the adjoining building at ground level, there is about a 1 foot gap between the two at the top. Photos presented by the city, from 2007, when the structure was condemned, show a space full of debris. Further, the basement was said to be full of tires, making this a fire hazard. This was said to be especially concerning because of the presence of Urban Community School immediately across the street. The primary problem the members of the CLC seemed to have with Housing's arguments were the simple lack of data. The members wanted to see evidence of the structural problems, and housing seemed unwilling to provide it - when asked for a structal report, the response was that "that is not our standard." A site visit by the commission seemed impossible without the permission of the owner. The commission appeared further concerned by the lack of any recent information to indicate whether the physical condition of the structure had changed. Commission member Michael McBride asked why, if the city is going to spend $10,000 to $15,000 to demolish this structure, should we not instead consider spending the same amount to abate the nuisance? Unfortunately, there isn't a mechanism in place to do this. I believe it is something that we need to seriously consider. The CLC voted unanimously to deny the request for demolition, with the understanding that with a site visit, this issue could be revisited soon. This house, in a historic district, was purchased by Scott Francis, a resident of the area, who wanted to fix it up and resell it. Images illustrating the residence are in the first group included in the meeting agenda. The house, built c. 1860, has had many significant changes over the years, the most obvious being the addition of a two story porch on the front of the house. The windows have been replaced, and the exterior has been covered with vinyl siding. As originally proposed, Mr. Francis wanted to remove the existing front door, and replace it with one that was wider, and similar in style to the one on the new house immediately to the east. He had already purchased a replacement door. He wanted to remove the side porch and convert the door there to a window. He said that this was because the presence of two doors facing the street would cause confusion as to which was the front. He further indicated that he had seen homeless people sleeping on the porch, and that it was a safety concern. Mr. Francis had also already purchased 6 over 6 double hung replacement windows for the entire house. Further, Mr. Francis indicated that he wanted to remove the plastic picket fence and replace it with something more appropriate looking. Finally, he said that he wanted to remove the vinyl siding and repaint the wood, if possible. If he found the wood siding was beyond repair, he would replace it with Hardieboard. His argument for these changes was that this was already an eclectic neighborhood, and his changes wouldn't be changing the feel of it. Further, fixing up the house would make the block look better. Commission member Thomas Coffey said that he was not persuaded that the eclectic character of the neighborhood should cause him to ignore the Secretary of the Interior's standards. There isn't any justification for changing the door and side porch, he said. These are the few historic features left. Years from now, he said, people will ask "Where was the Landmarks Commission when people were changing this stuff?" Francis indicated that the rear wing is later than the main structure of the house, and therefore less historically significant. Ed. note: It was quite common to build a smaller rear wing in this style, sometimes even at the same time as the rest of the house was built. 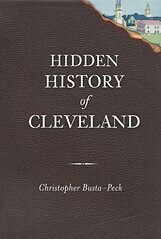 While the exact date of its construction is unclear, it is definitely before 1881, as it is illustrated in the City Atlas of Cleveland, Ohio, which was published that year. Roger Scheve, a resident of the neighborhood, spoke in support of the proposed renovation. I spoke against it. There were five letter provided in support, though Mr. Coffey wanted to note that these were form letters. Two letters were presented against the plan. Mr. Francis said that he had contacted the Cleveland Restoration Society for advice and that they had provided some assistance with choosing historically appropriate exterior colors. Edward Reich, the City Planning representative to the commission, said that for him, the two front porches are a non-starter. He stated that the side wing belonged there, and that he could not support the proposal. Commission member William Mason noted that the side of the house has greater visibility from the street here than it might elsewhere, and thus deserves more consideration. Mr. Francis agreed to obtain 1 over 1 windows, the style that would have been present originally, for the front of the house. The 6 over 6 ones he purchased will be used on the other three sides. He further agreed to obtain a front door with a transom of the same proportions as the original. The Landmarks Commission, voted on the plan, with the changes noted immediately above. This includes the removal of the side porch and the conversion of the door there to a window. It also includes the rebuilding of the front porch and the replacement of the plastic picket fence. All of the commission members voted in favor of the plan, with the exception of Mr. Reich, who voted against it. The next Cleveland Landmarks Commission meeting will be held on Thursday, May 13, at 9:00 am at the Cleveland City Hall. The agenda will probably be available on Tuesday, May 11th. It is the homeowners rights not the Cleveland Landmarks department or the Cleveland Restoration Society. This is not up for a vote. Do you not understand property rights. We as homeowner only have to meet the Ohio Zoning Standers to repair our properties. Landmarking of properties does not give control to Landmarks or the Cleveland Restoration departments. This is above the Zoning Codes in Ohio and the United States Standers of Building Codes. We as homeowner pay for the right to control our properties. The Cleveland Restoration Society provides technical advice to those who request it - that is the extent of their role with respect to individual homeowners and nothing more. I do understand property rights. I understand that to protect the public safety and property values, we have zoning laws, just as in most municipalities. Chapter 161 of the Cleveland zoning code is the Landmarks law. In the city of Cleveland, a property owner must consent for their building to be made a landmark. City Council has to vote to approve the creation of an individual landmark or a district. In the law, your city council chose to delegate the review of work to a group with a more extensive background in history and architecture, the Landmarks Commission. Mr. Francis chose to purchase a house in a landmark district. He had rehabbed a house in the district before, to a very high standard, so he was familiar with the legal requirements. These are the laws that we accept as residents of this city. If we feel they are inappropriate, we should work to change them. Thanks for another great instalment regarding the commission meetings. It is really refreshing to get a grasp of this via your summaries for those outside the 216 area code! You have a right to air your grievances, just don't be so impolite when stating said sour grapes. The City Counsel, Landmarks office, or any other special interested groups or party can not vote to delegate this authority to themselves. For our homes to be listed as a Federal Landmarks District we the property owner have a right to vote and give our consent for the Landmarking of our properties. If a vote is not done by all owner of the properties that would be affected the Landmarks district can be removed from the federal landmarks. What property owner in their right mind would vote to give control of their property to The City, Landmarks or special interested parties. We would loss control of our properties. We have been robbed of our right as private property owners. Others have had the Federal Landmarks remover from their properties. We need to do the same in the City of Cleveland !!!!!!!!!! !